For New Yorkers, the giant balloons from the Macy’s Thanksgiving Day Parade are as synonymous with the holiday as turkey and mashed potatoes. As the parade celebrates its 92nd year of bringing holiday joy to millions Thursday, take a look back at some of the famous balloons that have floated through the streets of Manhattan over the years. Felix the Cat was the first giant helium balloon to appear in the Macy's Thanksgiving Day Parade on Nov. 24, 1927. Snoopy made his Macy's Thanksgiving Day Parade debut on Nov. 28, 1968. 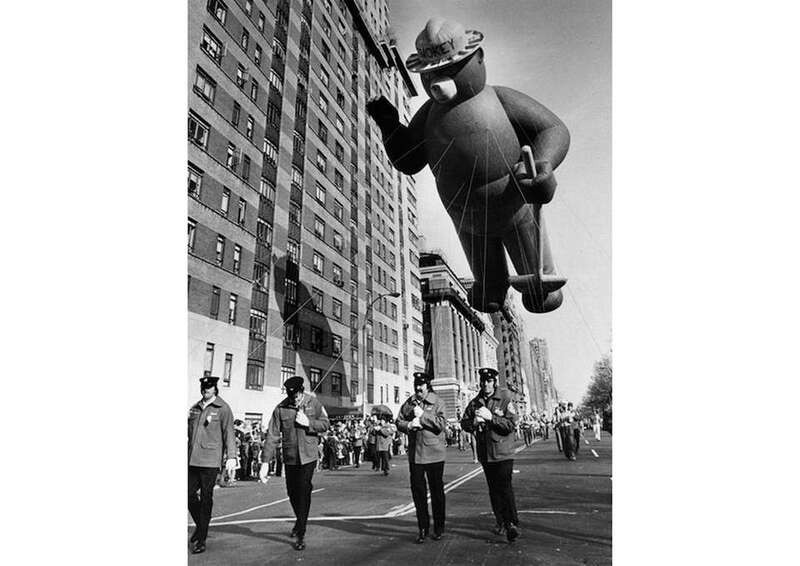 Smokey the Bear makes his way through Manhattan during the Macy's Thanksgiving Day Parade on Nov. 28, 1974. Smokey the Bear made his parade debut in 1966. 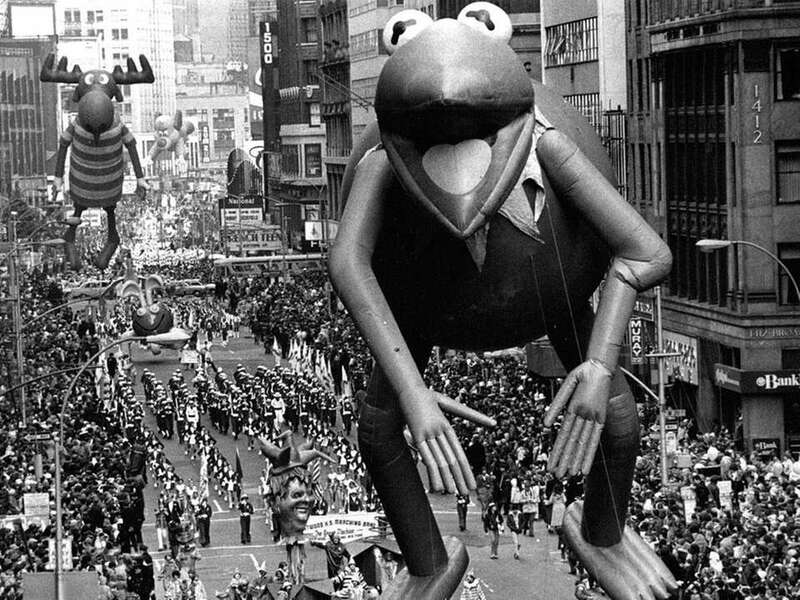 Bullwinkle trails Kermit the Frog along Broadway in the Macy's Thanksgiving Day Parade on Nov. 24, 1977. The first version of Bullwinkle - without Rocky - was introduced in 1961, and Kermit made his debut in 1977. Underdog soars above Broadway in the Macy's Thanksgiving Day Parade on Nov. 22, 1979. Underdog first floated down the streets of Manhattan in 1965. 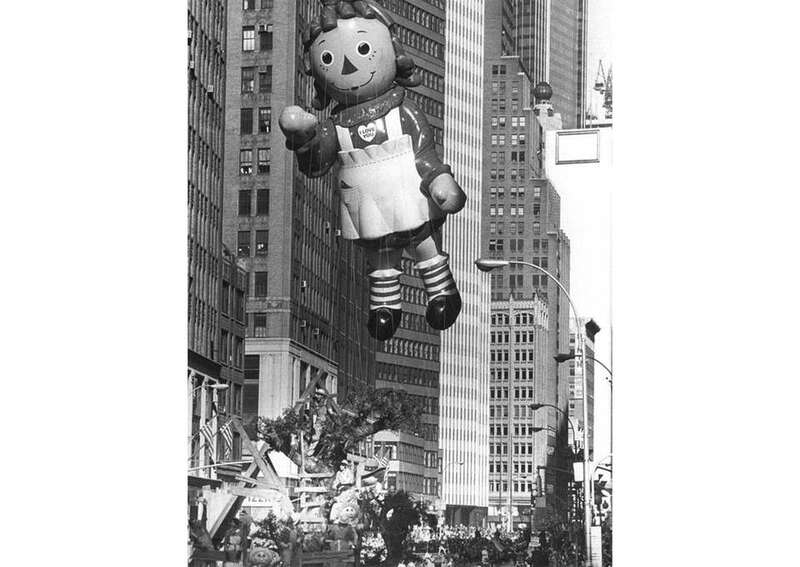 Raggedy Ann waves to the crowd during her Macy's Thanksgiving Day Parade debut on Nov. 22, 1984. Spiderman flies down Broadway during his debut in the Macy's Thanksgiving Day Parade on Nov. 26, 1987. Garfield and Big Bird float down Central Park West in the Macy's Thanksgiving Day Parade on Nov. 24, 1988. This was the first year Big Bird appeared in the parade. Garfield debuted in 1984. Ronald McDonald floats down Broadway during the Macy's Thanksgiving Day Parade on Nov. 22, 1990. The iconic clown made his parade debut in 1987. 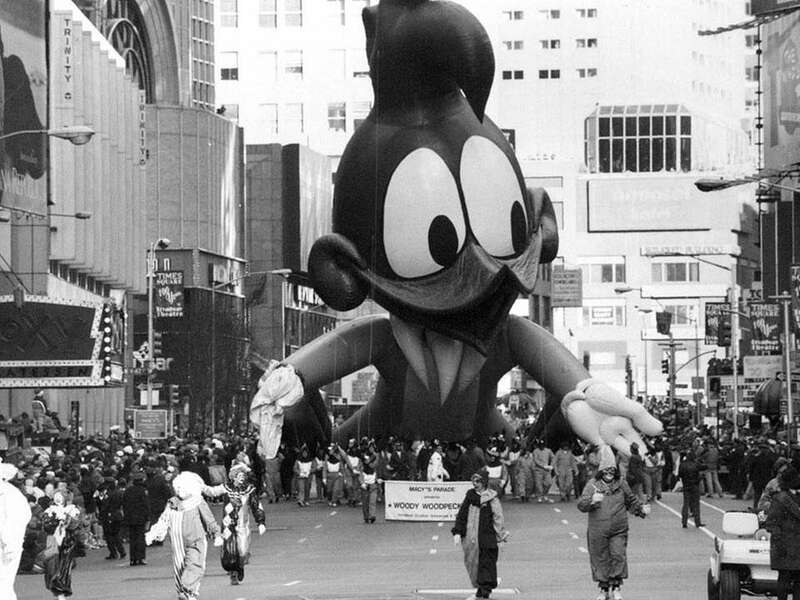 A partially deflated Woody Woodpecker marches down Broadway in the Macy's Thanksgiving Day Parade on Nov. 25, 1993. Woody Woodpecker first appeared in the parade in 1982. The Pink Panther celebrates the 70th anniversary of the Macy's Thanksgiving Day Parade on Nov. 28, 1996. Pink Panther was introduced to the parade in 1988. Tommy, Chuckie and Spike, from Nickelodeon's "Rugrats," thrill paradegoers during the Macy's Thanksgiving Day Parade on Nov. 26, 1998. The trio took their first romp through Manhattan in 1997. Cloe the Holiday Clown and the Macy's Stars float through Times Square, with Millenium Snoopy following behind, during the Macy's Thanksgiving Day Parade on Nov. 25, 1999. Cloe first appeared in the parade in 1994. Curious George floats down Broadway during his debut in the Macy's Thanksgiving Day Parade on Nov. 22, 2001. Harold the Fireman makes his way down Broadway during the Macy's Thanksgiving Day Parade on Nov. 22, 2001. Harold first took to the streets of Manhattan in 1945. Charlie Brown chases his elusive football during his debut in the Macy's Thanksgiving Day Parade on Nov. 28, 2002. Barney dons his band hat for the Macy's Thanksgiving Day Parade on Nov. 27, 2003. The lovable purple dinosaur first appeared in the parade in 1994. Pikachu floats along Broadway during the Macy's Thanksgiving Day Parade on Nov. 23, 2006. The iconic Pokemon character made his debut in 2001. SpongeBob SquarePants waves hello to paradegoers during the Macy's Thanksgiving Day Parade on Nov. 25, 2010. SpongeBob was first introduced in 2004. Hello Kitty makes her way along Central Park West during the Macy's Thanksgiving Day Parade on Nov. 22, 2012. Hello Kitty made her debut - sans plane - in 2007. The red Power Ranger floats through Manhattan during his debut in the Macy's Thanksgiving Day Parade on Nov. 27, 2014. The Macy's Star floats through the Manhattan parade route during the Macy's Thanksgiving Day Parade on Nov. 26, 2015. The gold star first appeared in 2001 to celebrate the parade's 75th anniversary. Macy’s Thanksgiving Day Parade set to wow crowds for 90th yearSome classic balloons are making a comeback this Thanksgiving. NYPD to deploy 81 sand trucks to Thanksgiving paradeThe move comes more than a week after a new ISIS threat. Secrets of the Macy's Thanksgiving Day ParadeThink you know everything about the iconic parade? Think again.